14 KEYFRAME O N T H E J O B AFTER A MODELER FINISHES BUILDING A CHARACTER, IT'S TIME FOR RIGGING ARTISTS TO ESSENTIALLY CREATE A DIGITAL SKELETON WITH JOINTS AND HANDLES SO THAT THE ANIMATORS CAN POSE THE CHARACTER. THESE SYSTEMS CAN GO FROM SIMPLE TO STAGGERINGLY COMPLEX. HERE, WE LEARN MORE ABOUT WHAT THE JOB ENTAILS. 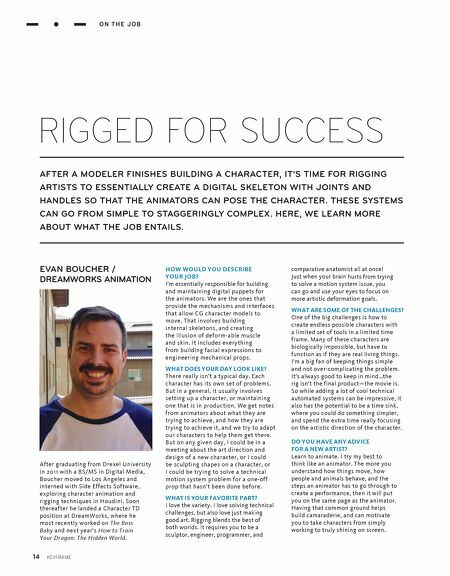 RIGGED FOR SUCCESS EVAN BOUCHER / DREAMWORKS ANIMATION After graduating from Drexel University in 2011 with a BS/MS in Digital Media, Boucher moved to Los Angeles and interned with Side Effects Software, exploring character animation and rigging techniques in Houdini. Soon thereafter he landed a Character TD position at DreamWorks, where he most recently worked on The Boss Baby and next year's How to Train Your Dragon: The Hidden World. HOW WOULD YOU DESCRIBE YOUR JOB? I'm essentially responsible for building and maintaining digital puppets for the animators. We are the ones that provide the mechanisms and interfaces that allow CG character models to move. That involves building internal skeletons, and creating the illusion of deform-able muscle and skin. It includes everything from building facial expressions to engineering mechanical props. WHAT DOES YOUR DAY LOOK LIKE? There really isn't a typical day. Each character has its own set of problems. But in a general, it usually involves setting up a character, or maintaining one that is in production. We get notes from animators about what they are trying to achieve, and how they are trying to achieve it, and we try to adapt our characters to help them get there. But on any given day, I could be in a meeting about the art direction and design of a new character, or I could be sculpting shapes on a character, or I could be trying to solve a technical motion system problem for a one-off prop that hasn't been done before. WHAT IS YOUR FAVORITE PART? I love the variety. I love solving technical challenges, but also love just making good art. Rigging blends the best of both worlds. It requires you to be a sculptor, engineer, programmer, and comparative anatomist all at once! Just when your brain hurts from trying to solve a motion system issue, you can go and use your eyes to focus on more artistic deformation goals. WHAT ARE SOME OF THE CHALLENGES? One of the big challenges is how to create endless possible characters with a limited set of tools in a limited time frame. Many of these characters are biologically impossible, but have to function as if they are real living things. I'm a big fan of keeping things simple and not over-complicating the problem. It's always good to keep in mind…the rig isn't the final product—the movie is. So while adding a lot of cool technical automated systems can be impressive, it also has the potential to be a time sink, where you could do something simpler, and spend the extra time really focusing on the artistic direction of the character. DO YOU HAVE ANY ADVICE FOR A NEW ARTIST? 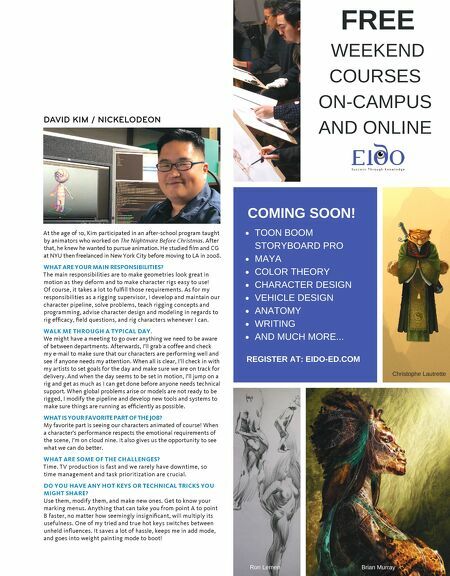 Learn to animate. I try my best to think like an animator. The more you understand how things move, how people and animals behave, and the steps an animator has to go through to create a performance, then it will put you on the same page as the animator. Having that common ground helps build camaraderie, and can motivate you to take characters from simply working to truly shining on screen.